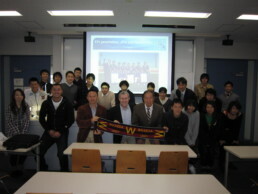 05/12/11 – Following an invitation by Prof. Dr. Toru Fukubayashi, famous researcher and orthopaedic surgeon (was among the first to perform double ACL reconstructions many years ago), today I’ve the honor to hold a presentation (Injury prevention in football – from research to the field) at the WASEDA University, Faculty of Sports Sciences, Tokyo. Waseda University (est. 1882) is one of the most prestigious private universities in Japan and Asia.